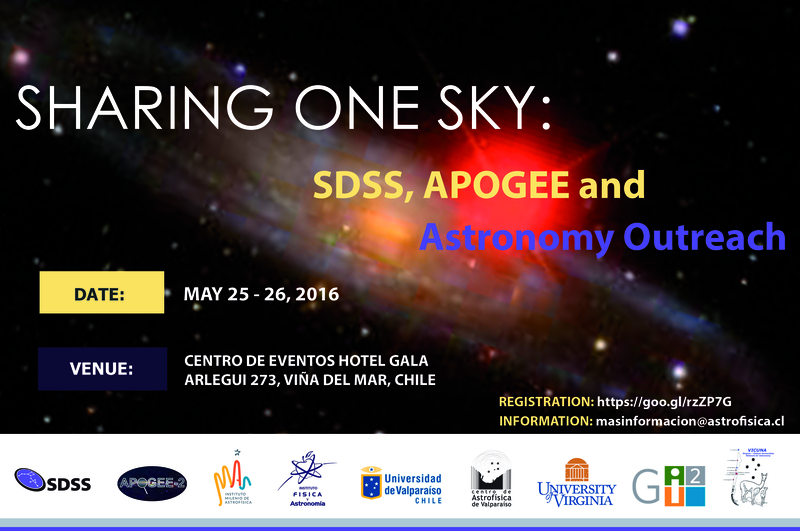 We are pleased to announce the first SDSS/APOGEE Workshop on Outreach and Education, which will take place at the Hotel Gala (http://www.galahotel.cl/en/) in Viña del Mar, Chile, on May 25-26, 2016. The Workshop Objectives and other information are provided below. Viña del Mar is Chile’s largest and best-known beach resort town. It is 120km (74 miles) NW of Santiago. The city was founded in 1874 as a weekend retreat and garden residence for the wealthy elite from Valparaíso and Santiago. The city is divided into two sectors: downtown and the beachfront. The hotel Gala, while downtown, is still only a 10-minute walk from the beach. Viña del Mar is easily reachable from Santiago (both city and airport) by bus, via a 1 hour 45 min trip from Santiago. Private taxi transport can also be arranged for you. Attendees are responsible for making their own hotel reservations. A block of rooms has been reserved at the Gala Hotel. Please book your room as soon as possible directly at: http://www.galahotel.cl/en/. Please, mention that you are an SSDS/APOGEE meeting participant in the hotel registration. Attendees should also please register for the workshop on the registration form https://goo.gl/rzZP7G not later than 29 April 2016, or cut/paste the information below and emailing to Natalia Atencio natencio@astrofisica.cl (with a copy to jura.borissova@uv.cl; veronica.motta@uv.cl). A workshop funded by the Center for Global Inquiry + Innovation in partnership with the Vice President for Research and the Dean of the College of Arts and Sciences at the University of Virginia, as well as the Universidad de Valparaiso and Millennium Institute of Astrophysics (MAS).